My last two blog posts have brought you quick but demanding workouts that can be performed in under 30 minutes. When working out in a time crunch having a plan of attack is critical to making the most out of your time in the gym. In order to give the legs their best workout in the least amount of time the focus of exercise selection must be on multi-joint compound movements, no leg extensions here! The backbone of any program with strength and hypertrophy as the goal should contain major hip dominant, and knee dominant lifts, such as the squat and deadlift. In this workout the contrast method will be used. The contrast method uses a combination of Heavy load lower repetition exercise with lightly weighted or un-weighted exercise. This method will nail all of your muscle fibers through PAP (post-activation potentiation.) PAP will allow you to gain strength in your heavy exercise following each set of your longer, un-weighted set due to better motor unit recruitment. Without further adieu here is the workout! 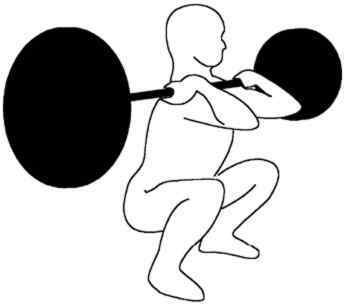 Perform 1 set of 5 repetitions on the front squat and immediately after the set (using a box or bench) perform a bodyweight squat to a box, immediately upon touching the box or bench explode into a vertical jump. Reset and continue for 45 seconds. Rest for 45 seconds and repeat 3 times. Following the third set rest 60 seconds and move to circuit 2. With the same weight as the front squats perform all out set of back squats with the same weight, coming within 1-2 reps of failure. Realistically this should be 10-15+ reps in most cases. Following this set immediately perform 60 seconds of bodyweight jump squats. Rest 60 seconds and move to circuit 3. Perform 3 sets of Dumbbell Romainian Deadlifts, immediately after each set perform 20 dumbbell calf raises followed by 20 alternating jump lunges. Rest 45 seconds after each set and repeat 3 rounds. There you have it, a brutal yet effective workout to blast your lower body in under 30 minutes. As always make sure your form is up-to-par, as the intensity of this workout will likely require using submaximal, albeit heavy workloads to get the best effect. Share your comments below! Numminello, Nick. “Contrast Training for Strength, Size, and Power.” T NATION.com. Testosterone, LLC, 11 May 2009. Web. 20 May 2012. <http://www.t-nation.com/free_online_article/sports_body_training_performance/contrast_training_for_strength_size_and_power>. Previous Story Previous post: Is your Training in a Rut?